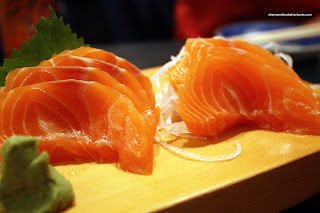 * New location in PoMo"
"Authentic Japanese food". This almost seems like an oxymoron in the GVRD. Everyone, from Vietnamese to Chinese people operate "Japanese" restaurants. What's next? A Latin Japanese joint? 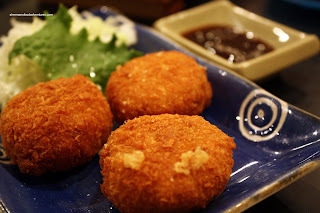 There are a few known authentic Japanese restaurants such as Shiro, Ajisai, Toshi, Tokachi and Takarabune. 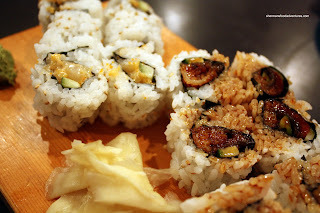 However, not many people know about Fuji Sushi (unless you live in Burquitlam). Located in a large; yet rundown-looking plaza on Clarke Road, Fuji Sushi is so authentic that the daily specials are written only in Japanese. We had to do some shopping at Lougheed Mall, so we decided to give it try tonight. The place really looks unassuming from the outside. In fact, it doesn't look like much at all. I got Viv to go in to get a table while I dealt with the kiddies. While attempting to cross the parking lot to the restaurant, some SUV pulls in from Clarke Road and guns it. Hello? WTH? Geez, I'd rather be in Richmond then, at the very least, they're driving way too slow to hurt anyone. When I got in, Viv said she hadn't got the attention of anyone as of yet. While we stood there, it probably took a good 5 minutes to be acknowledged. After that, it took awhile to figure out if they were actually going to give us a table or not. Viv finally asked how long it was going to be and to their credit, the lady gave us a table that she was about to put a "reserved" sign on. The seating arrangements here are pretty tight, so you'll really get to know the people beside you, which we did. I think the couple beside us were amused at our juggling act of eating, me taking pictures and attending to the kids. I sometimes wonder why I don't go nuts. As for the food, we started with the Spinach Gomae which was excellent. For those used to the "dressing- drenched" version, this one might not be familiar. 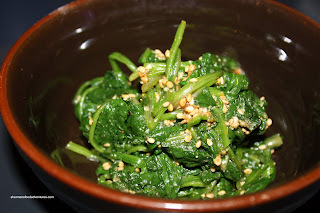 Only lightly dressed and topped with toasted sesame seeds, you can actually make out it is spinach. Next up were the Potato Croquettes. Served hot and really crunchy on the inside while still soft on the inside, these were a textural delight. 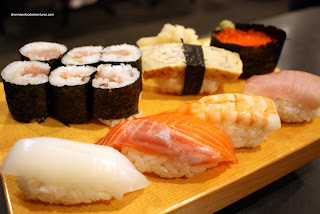 ik a, salmon, ebi, tuna, tomago, tobiko and a tuna roll. Nicely presented and fresh, the were enjoyable to eat. Again, the sushi rice was the right consistency (soft, while a tad chewy) and neatly prepared. Our meal was supposed to end there; but we noticed the table next to us had ordered the Spider Roll and it look darn good. Of course by the power of suggestion, we had to get it as well! We're such pushovers... So we got one and it was delicious. 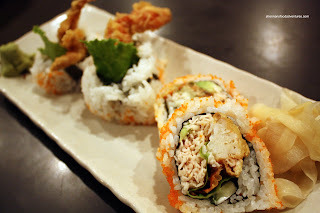 The roll was tight enough, so it didn't fall apart when eaten and the soft shell crab was crispy and meaty. 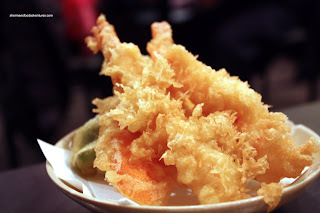 In a twist of fate, the table next to us saw what we were eating and got a Tempura Udon as well. Luckily we were both winding down; otherwise I'm sure we'd keep ordering each others' dishes! And with that, I was full; but there was so much more to try. Next time I need to get them to decipher the daily specials for me. It's nice that an good authentic Japanese restaurant is close by. It definitely helps remind me of what real Japanese food is supposed to look and taste like. Yum - my parents have been going to Fuji Sushi for years (they live in Coquitlam). It's a great little place (especially compared to the many mediocre 'Japanese' restaurants). Glad you enjoyed it! I just love your blog and check it at least once a day to see if you have posted new reviews. Was hoping that you'd review Fuji Sushi and got my wish granted today. Great review. Will definitely check Fuji out soon. Thanks too for the review on Calypso. Always on the look-out for authentic and delicious Jamaican food. i love fuji sushi! I live in New West, so whenever i'm craving for authentic japanese food, Fuji is my number one choice. It is indeed a gem! Can't believe I didn't try it earlier!